Based on the true story of Forrest Tucker, from his audacious escape from San Quentin at the age of 70 to an unprecedented string of heists that confounded authorities and enchanted the public. Wrapped up in the pursuit are detective John Hunt, who becomes captivated with Forrest’s commitment to his craft, and a woman who loves him in spite of his chosen profession. Starring Robert Redford, Casey Affleck, Sissy Spacek, Danny Glover, Tom Waits and John David Washington. Fired from the National Security Agency, Frans Balder recruits hacker Lisbeth Salander to steal FireWall, a computer program that can access codes for nuclear weapons worldwide. The download soon draws attention from an NSA agent who traces the activity to Stockholm. Further problems arise when Russian thugs take Lisbeth’s laptop and kidnap a maths whiz who can make FireWall work. Now Lisbeth and an unlikely ally must race against time to save the boy and recover the codes to avert disaster. Starring Claire Foy, Sverrir Gudnason, LaKeith Stanfield, Stephen Merchant and Vicky Krieps. All Clara wants is a key, a one-of-a-kind key that will unlock a box that holds a priceless gift from her late mother. A golden thread, presented to her at godfather Drosselmeyer’s annual holiday party, leads her to the coveted key, which promptly disappears into a strange and mysterious parallel world. It’s there that Clara encounters a soldier named Phillip, a gang of mice, the regents and the tyrant Mother Ginger. 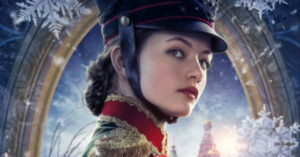 Starring Keira Knightley, Matthew Macfadyen,Morgan Freeman, Helen Mirren and Richard E Grant. We’re back with the kids from St Bernadette’s Primary School in Coventry as the staff and students audition for a coveted place in a spectacular rock musical competition. With the unique feel-good charm of the original film, Celia Imrie reprises her role as headmistress Mrs Keen, starring alongside Meera Syal, Ruth Jones, Anna Chancellor, Hugh Dennis, Helen George, Craig Revel Horwood and Simon Lipkin. Fantastic Beasts: The Crimes of Grindlewald [12A] 134 mins. At the end of the first film, the powerful dark wizard Gellert Grindelwald was captured by MACUSA (Magical Congress of the United States of America) with the help of Newt Scamander. But, making good on his threat, Grindelwald escaped custody and has set about gathering followers, most unsuspecting of his true agenda: to raise pure-blood wizards up to rule over all non-magical beings. In an effort to thwart Grindelwald’s plans, Albus Dumbledore enlists his former student Newt Scamander, who agrees to help, unaware of the dangers that lie ahead. Lines are drawn as love and loyalty are tested, even among the truest friends and family, in an increasingly divided wizarding world. Starring Eddie Redmayne, Johnny Depp, Jude Law, Zoe Kravitz, Katherine Waterston, Dan Fogler, Alison Sudol and Ezra Miller. This is a foot-stomping celebration of Queen, the music and the band’s extraordinary lead singer, the late Freddie Mercury. The film traces the meteoric rise of the band through its iconic songs and revolutionary sound. The band members reach unparalleled success, but in an unexpected turn Freddie, surrounded by darker influences, shuns Queen in pursuit of his solo career. Having suffered greatly without the collaboration of Queen, Freddie manages to reunite with his bandmates just in time for Live Aid, leading the band in one of the greatest performances in the history of rock music. Starring Rami Malek, Lucy Boynton, Gwilym Lee, Ben Hardy, Joseph Mazzello, Aidan Gillen, Tom Hollander, Allen Leech and Mike Myers. This runs for the first film at weekends and at various other times (see quick-view listings page). Great children’s films for just £8.50 and for every child ticket bought, an adult goes free. Grab a Kids’ Club loyalty card, have it stamped five times and get your sixth ticket free.